7 MIL thickness - a 10 square roll weighs only 23 lbs! Epilay® ProtecTite® Superior Roofing Underlayment with its advanced engineering is highly recommended for mechanically attached, coated woven synthetic roofing underlayment for sloped roofs. ProtecTite® Superior is specifically manufactured to replace the #15 Felt and #30 Felt. 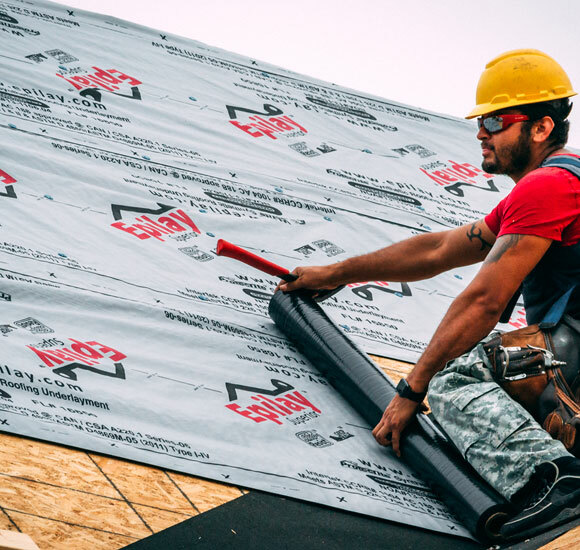 ProtecTite® Superior’s GripWalk® unique gray top layer which provides for a cooler working surface can be used under primary roofing materials to replace #15 Felt and #30 Felt. GripWalk® high traction walking surface permits easier steep slope walk-ability, even during high condensation or moisture on the surface. ProtecTite® Superior’s Skid-Resist® anti-skid bottom surface made with advanced polymers helps keep the underlayment intact and prevents the fabric from tearing while it is being fastened avoiding any leakages through the underlayment layer. ProtecTite® Superior is 25 times stronger than #15 Felt and #30 Felt and 4x lighter than #15 Felt and #30 Felt. With a 7mil thickness, a 10 square roll weighs only 23 lbs.! This super low weight combined with 48" width and 250 ft. run length means big savings in time and labor - over 30% faster to install than felt!. These unique design features, when coupled with ProtecTite® Superior’s exceptional light weight and exceptional tear strength, allows the contractor to easily carry the roll up and down the ladder. Fewer laps, cuts, and roll handling means you can do more jobs in less time resulting in huge savings for you, the roofing contractor. 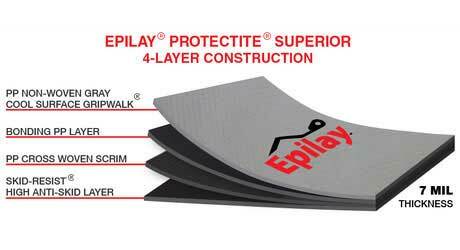 Epilay® GripWalk® is our unique high-traction top layer which reduces heat and provides a cooler working surface. GripWalk®‘s textured walking surface permits easier walkability on steep slopes and retains its non-slippery properties even during high condensation and moisture on the surface. Epilay® SkidResist® is a very high anti-skid bottom layer made with superior technology and advanced polymers that helps keep the underlayment intact and prevents the fabric from tearing while it is being fastened, avoiding any leakages. Ensuring enhanced stability and safely. Works best for use under Asphalt Shingles & Residential Metal. Does not wrinkle, crack or become stiff in colder temperatures for smooth and easy installation. ProtecTite® Superior will not dry out or leach oil in high heat enviroments as organically saturated felts do. 4 times lighter and 25 times stronger than #15 Felt and #30 Felt. Class A Fire ASTM E108 - Meets & exceeds ASTM D 226 Type I & II and ASTM D 4869/ASTM D4869M-05 (2011) Type I-IV. Synthetic construction impervious to mold growth. Top quality 4 ply underlayment (3 ply cross woven coated polypropylene with an additional layer of non woven polypropylene). Strong and durable polymer construction. GripWalk® retains non slippery properties even during condensation or moisture on the surface. GripWalk® high traction top surface with light grey color reduces heat and Skid-Resist® high anti-skid bottom with superior technology and advanced polymers, providing a better working environment and less tear. Temperature performance range -40°F to 240°F (-40°C to 115°C).